Hopelessness is the debut solo album by British-American artist Anohni (formerly known as Antony Hegarty), released on 6 May 2016 on Secretly Canadian, Rough Trade, and Hostess. Featuring co-production by Hudson Mohawke and Oneohtrix Point Never, the album departs from the chamber pop style of Anohni's previous work with Antony and the Johnsons, instead exploring an electronic sound and engaging directly with political and environmental themes in the form of protest songs. Hopelessness was released to critical acclaim. It peaked at number 26 on the UK album charts and number 121 in the US. Hopelessness was nominated for a Mercury Prize in 2016, and Anohni was nominated for Best British Female at the BRIT Awards in 2017. Following her plaintive, chamber pop-styled work with the group Antony and the Johnsons in the early 2000s, Antony Hegarty changed her name to Anohni and began developing a radically different "Trojan horse" project that would instead feature a "glossy, plastic sound" while dealing more directly with political and environmental issues. Discussing her decision to move away from her earlier style, she reasoned: "at this point, I really feel like it’s all hands on deck. An artist that’s fiddle-faddling in opaque, gossamer gestures — I mean it’s fine to do that, totally fine, but there’s no time left." Conceptualized and recorded over three years, Anohni first began to collaborate with electronic musician Daniel Lopatin, whose work as Oneohtrix Point Never she had previously covered. Anohni and Lopatin initially speculated on creating "a kind of Blade Runner–Kitarō–Japanimation soundtrack" before producer Ross Birchard, better known for his work in hip hop (cf. Kanye West) as Hudson Mohawke, became involved with the project in 2014. Birchard and Anohni had also collaborated on Birchard's 2015 album Lantern, during which time he sent Anohni the demo of what would become "Drone Bomb Me." Speaking to the New York Times, Anohni explained that "the kind of relentless, exuberant, almost ecstatic positiveness of Hudson’s music was the perfect foil for more challenging lyrics than people would be used to hearing from me." Both producers worked on the tracks, with Anohni also taking part in the production process; Mohawke recalled: "she’s not just writing these songs. She loves getting in there and twisting stuff up in Pro Tools and chopping stuff up and editing and rearranging. She’s permanently finding all of these little magic things that wouldn’t have occurred to us." Lopatin stated that "her range is crazy, the ideas are nuts, the movement is wild — you basically don’t have to do that much. " I tried to keep a focus on myself in terms of addressing my complicity in so many of these issues — as a taxpayer, as a consumer, as a passive participant. I got to thinking perhaps as an artist, even as an artist with the best of intentions, that I was kind of a microcosm of the brokenness of the whole system. That within my body I contained the whole conflict. Commenting on "4 Degrees" in a fan interview earlier in the year, Hegarty had stated that she had "grown tired of grieving for humanity", adding that she felt she "was not being entirely honest by pretending that I am not a part of the problem. '4 Degrees' is kind of a brutal attempt to hold myself accountable, not just valorize my intentions but also reflect on the true impact of my behaviors." The song "Obama" depicts disillusionment with the tenure of US President Barack Obama. On 23 February 2015, Anohni announced Hopelessness via the Antony and the Johnsons' website and Facebook account. In the announcement, Anohni described the album as "an electronic record with some sharp teeth". In a fan interview, Anohni described the upcoming album as "as different as could be from my previous work", adding she was "not sure that many of [those] who prefer the early chamber music style will enjoy it". Characterising it as a "dance / experimental electronic record with quite a dark thematic undertow", she revealed spring 2016 as the release date. On 30 November 2015, Anohni released "4 Degrees", the first song off of Hopelessness, along with an accompanying message: "In solidarity with the climate conference in Paris, giving myself a good hard look, not my aspirations but my behaviors, revealing my insidious complicity. It's a whole new world. Let’s be brave and tell the truth as much as we can." On 9 March 2016, Anohni announced the release of the album's second single "Drone Bomb Me" via Facebook. The song, which premiered on Annie Mac's show on BBC Radio 1 later that day, was accompanied by a music video which she described as "insanely beautiful". As revealed shortly after the announcement on Anohni's Instagram account, the video was directed by Nabil Elderkin and stars English supermodel Naomi Campbell. On the same day, Anohni also revealed that Hopelessness will be released on 6 May 2016, along with the album's track listing. Hopelessness received acclaim from contemporary music critics. At Metacritic, which assigns a normalized rating out of 100 to reviews from mainstream critics, the album received an average score of 83, based on 30 reviews, which indicates "universal acclaim". Tim Jonze of The Guardian called Hopelessness "as profound a protest record as anyone has made in decades, brimming with anger, and yet, somehow, oddly accessible," concluding that, "For all its bleakness, Hopelessness leaves you feeling anything but." Writing for Exclaim!, Andrea Warner characterized Hopelessness as "a shimmering, shadowy electronic pop protest record that thunders and sparks, avenges and retreats, attacks and empowers," noting Anohni's "ownership and authority over her artistic voice that we've not yet seen before." T. Cole Rachel of Spin called the album "a potent political statement," and described the music as "gorgeous, matching the intensity of the subject matter without overwhelming it and giving the appropriate space to ANOHNI’s voice, which remains a glorious instrument." Jenn Pelly of Pitchfork praised the album, stating, "Anohni, HudMo, and OPN meet on an astral plane and construct a sleek salon there, where we can reflect on the current moment and perhaps be spurred to action," calling the album "some of the most accessible and pristinely infectious music that any of these people have made. Writing for NPR, Ann Powers said of the album, "The subject matter on Hopelessness can be grisly — state-sponsored execution, torture, animals expiring in trees — but the music, and Anohni's singing especially, brings the emotional rush of revelation." 5. "I Don't Love You Anymore"
8. "Why Did You Separate Me from the Earth?" ^ a b "Antony Announces New Album HOPELESSNESS, Co-Produced with Oneohtrix Point Never and Hudson Mohawke". Pitchfork Media. 23 February 2015. Retrieved 12 March 2016. ^ a b c Warner, Andrea. "ANOHNI HOPELESSNESS". Exclaim!. Retrieved 4 May 2016. ^ a b c Jonze, Tim (5 May 2016). "Anohni: Hopelessness review – the most profound protest record in decades". The Guardian. Retrieved 5 May 2016. ^ a b c d e f g h i Pareles, Jon. "Anohni: Embracing a New Name, and Sound". The New York Times. Retrieved 22 August 2016. ^ Fitzmaurice, Larry. "Listen: Antony Collaborates With Oneohtrix Point Never". Pitchfork Media. Retrieved 22 August 2016. ^ Basweld, Frankie (6 May 2016). "Anohni HOPELESSNESS". The Quietus. Retrieved 27 February 2017. ^ Partridge, Kenneth (6 May 2016). "Anohni makes pop music for a world about to burst". The A.V. Club. Retrieved 6 May 2016. ^ a b Stosuy, Brandon. "Anohni Finds Hope in Hopelessness". Pitchfork Media. Retrieved 22 August 2016. ^ a b Gordon, Jeremy (21 October 2015). "ANOHNI (F.K.A. Antony) on New LP HOPELESSNESS: "As Different as Could Be From My Previous Work"". Pitchfork. Retrieved 1 December 2015. ^ "Antony and the Johnsons news". Antonyandthejohnsons.com. Retrieved 18 June 2015. ^ "Hopelessness album announcement I". Facebook. 23 February 2015. Retrieved 8 April 2015. ^ Camp, Zoe (30 November 2015). "ANOHNI (F.K.A. Antony) Shares New Song "4 Degrees"". Pitchfork. Retrieved 1 December 2015. ^ "4 Degrees single announcement". Facebook. 30 November 2015. Retrieved 1 December 2015. ^ "Drone Bomb Me single announcement I". Facebook. 9 March 2016. Retrieved 9 March 2016. ^ "Drone Bomb Me single announcement II". Facebook. 9 March 2016. Retrieved 9 March 2016. ^ "Hopelessness release date". Instagram. 9 March 2016. Retrieved 9 March 2016. ^ "Hopelessness album announcement II". Facebook. 9 March 2016. Retrieved 9 March 2016. ^ a b "Reviews for Hopelessness by Anohni". Metacritic. Retrieved 5 May 2016. ^ Deming, Mark. "Hopelessness – Anohni". AllMusic. Retrieved 6 May 2016. ^ Gill, Andy (4 May 2016). "Anohni, Hopelessness – album review: 'A bitterly beautiful record'". The Independent. Retrieved 4 May 2016. ^ Richards, Sam (5 May 2016). "Anohni – 'Hopelessness' Review". NME. Archived from the original on 21 September 2016. Retrieved 5 May 2016. ^ Empire, Kitty (8 May 2016). "Anohni: Hopelessness review – a radical album for a time of crisis". The Observer. Retrieved 8 May 2016. ^ a b Pelly, Jenn (5 May 2016). "ANOHNI: HOPELESSNESS". Pitchfork. Retrieved 5 May 2016. ^ Harrison, Ian (June 2016). "Voice of Dissent". Q (359): 116. ^ Hermes, Will (12 May 2016). "Hopelessness". Rolling Stone. Retrieved 12 May 2016. ^ a b Rachel, T. Cole (3 May 2016). "Review: ANOHNI, 'Hopelessness'". Spin. Retrieved 4 May 2016. ^ "The 33 Best Albums of 2016". Thump. 8 December 2016. Retrieved 8 December 2016. ^ "Albums of the Year". Rough Trade. 14 November 2016. Archived from the original on 16 November 2016. Retrieved 15 November 2016. ^ "50 Best Albums of 2016". Billboard. 12 December 2016. Retrieved 25 January 2017. ^ "The Best 50 Albums Of 2016". NPR. 5 December 2016. Retrieved 25 January 2017. ^ "50 Best Albums of 2016". Rolling Stone. 28 November 2016. Retrieved 25 January 2017. ^ "The 50 Best Albums of 2016". Paste. 30 November 2016. Retrieved 1 December 2016. ^ "The 50 Best Albums of 2016". Mojo. 22 November 2016. Retrieved 22 November 2016. ^ "Australiancharts.com – Anohni – Hopelessness". Hung Medien. Retrieved 14 May 2016. ^ "Austriancharts.at – Anohni – Hopelessness" (in German). Hung Medien. Retrieved 19 May 2016. ^ "Ultratop.be – Anohni – Hopelessness" (in Dutch). Hung Medien. Retrieved 13 May 2016. ^ "Ultratop.be – Anohni – Hopelessness" (in French). Hung Medien. Retrieved 13 May 2016. 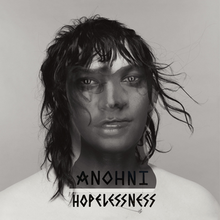 ^ "Dutchcharts.nl – Anohni – Hopelessness" (in Dutch). Hung Medien. Retrieved 13 May 2016. ^ "Lescharts.com – Anohni – Hopelessness". Hung Medien. Retrieved 16 May 2016. ^ "Offiziellecharts.de – Anohni – Hopelessness" (in German). GfK Entertainment Charts. Retrieved 14 May 2016. ^ "GFK Chart-Track Albums: Week 19, 2016". Chart-Track. IRMA. Retrieved 14 May 2016. ^ "Italiancharts.com – Anohni – Hopelessness". Hung Medien. Retrieved 14 May 2016. ^ "Swedishcharts.com – Anohni – Hopelessness". Hung Medien. Retrieved 13 May 2016. ^ "Swisscharts.com – Anohni – Hopelessness". Hung Medien. Retrieved 18 May 2016. ^ "Official Albums Chart Top 100". Official Charts Company. Retrieved 14 May 2016. ^ "Anohni Chart History (Billboard 200)". Billboard. Retrieved 17 May 2016. ^ "Jaaroverzichten 2016 Albums". Hung Medien. Retrieved 29 December 2016.